A letter of thanks from Martha Berry for the donation of magazines and Christmas cards by Miss Sara Hayden. Berry goes on to describe their great need for new books. The ones they have are so used that they are threadbare and the librarian struggles to try to prolong their lives as best she can. 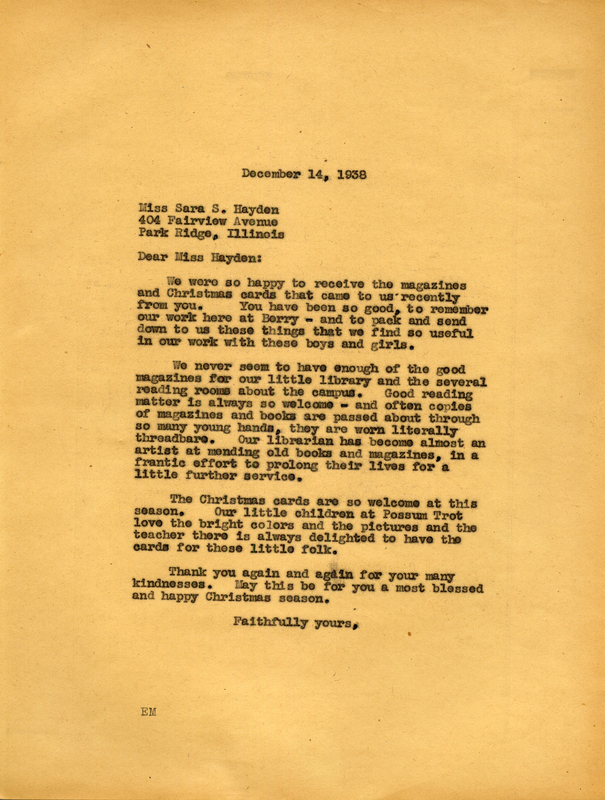 Martha Berry, “Letter to Miss Sara S. Hayden from Martha Berry.” Martha Berry Digital Archive. Eds. Schlitz, Stephanie A., Jessica Hornbuckle, Camille Hanner, et al. Mount Berry: Berry College, 2016. accessed April 18, 2019, https://mbda.berry.edu/items/show/14430.